mon petit lyons: SMS Giveaway Day! This is a fat quarter bundle of Wee Woodland by Keiki for Moda + an extra yard of ABC in Turquoise. I hope you like it, I've been hoarding it for a while and figured it was high time to share it. In my kitchen I know we are just on the cusp of the local tomato season, which means Watermelon and Tomato Salad with Lime Vinaigrette. I hope that gave you a little glimpse into the goings-on here at mon petit lyons. You can see my finished quilts, recipes, or tutorials tabs at the top if you are curious to see more. To be eligible for the Giveaway, just leave me a comment. Tell me something fun you are doing this summer, your favorite fabric line, what you would do with the fabric if you won, or how I can keep my kids busy over summer break. I'll let mr. random pick a winner, but you can be sure I'll have fun reading all your responses! I LOVE your farmer's wife! We're going to the beach...I can't wait. =) Thanks for a chance to win. Love your Farmer's Wife quilt, gorgeous!!!! This summer I am hoping to spend a long time at the beach with my boys! I'll be sewing up a storm! This fabric is great! Thanks for the giveaway! I'll be spending my summer playing softball and working...fun! This summer, I'm moving in my first house with my boyfriend and I can't wait ! Even though it's not out yet, I know La Dee Da will be one of my favorite line ever ! I've been waiting for the past 3 months and it's coming out next month ! Hope that helps and thanks for the giveaway ! what a wonderful giveaway! I think I would make a fabulous summer bag with those fabrics! i bought a zoo pass so i can take my boy anytime he wants to go ... which is just about every day! I'm spending time with family--my sister an I are going to try traveling together! Those are great fabrics! I LOVE the flowers from your garden too! I wish I could keep something alive! LOL. This summer we will be camping, going to the beach and using our passes to Sea World!!! I have so many favorite fabric lines. I love Nightshade by Tula Pink. Your hydrangeas are beautiful! This summer I am going to spend as many days on the lake in our pontoon as possible. Lots of playing outside with no agenda. Whatever comes up... making fairy houses, playing with water, entertaining the dog, running, jumping, dancing, leaping, singing, digging for worms, planting and picking and snacking. I can't choose just one fabric line that I love, I love to mix and match through them all. This summer I am planning on hitting the beach as often as possible and heading out (hopefully) for some whitewater kayaking trips. Also, I will be doing fun arts and crafts (or craps - their wording) with my nephews, 2 and 6. We will be camping up a storm, hitting the zoo, and heading to the Field Museum in Chicago! these are gorgeous!! i'll be teaching summer school and reading books for enjoyment this summer! I am so looking forward to tomatoes this summer! My daughter and I have a raised bed veggie garden that looks great so far. Thanks for the giveaway. Kimberly 4throse(at)bellsouth(dot)net. I am finally going on VACATION this summer! My husband is an attorney and he has been on a really busy case for the past 2 years so we haven't been able to do anything fun! I grew up near Shelby, NC and I really miss the south!! I am most looking forward to the new fabric line Mama Said Sew by Sweetwater and Simply Color by Vanessa!! Thanks for the wonderful giveaway!! What great fabric! If I win it, it 2will be going into a quilt for one of the many, many, many babies that my friends have been having or will be having in 2012. three little girls are already here and several more babies are on the way. Oy vey! great fabrics! i'm swooning over field study at the moment :) among so many others, of course! This summer, we are going to the beach (A LOT). I also plan on taking my boys on more "adventures" where we explore new woods or new parks or different neighborhoods. thank you for your giveaway, this fabric is adorable!!! I am so looking forward to summer...no more getting up and rushing around to get my daughter to school on time. My daughter turns 16 this summer and she wants to learn how to sew so I think our summer is going to be spent in front of the sewing machine during the mornings. This fabric would go toward her first quilt that I'm going to help her make. I plan on being in the pool alot this summer! Thanks for the giveaway! Let's see... things to do.. When my girls were young we did scavenger hunts (lunch bag with things to find written on the outside or pictures draw on outside), or circle cut out of cardboard with a circle cut out of the center - send it flying outside and when it lands see what is in the inner circle. Hope you have a great summer. Oh my goodness you have so many great projects!! I love the hydrangas too (can't seem to ever spell them right). The patchwork prism looks wonderful! I need to sew mine together before it falls off my sewing table! Something we do with our kids (3 and 2) is take them bowling. It's really cheap and takes at least an hour and they absolutely love it! Another thing outside that we do is get a bowl of water and paintbrushes and then they can "paint" the deck. Usually they end up spilling the water after a while but they have fun! I will be spending the summer making quilts for my twin granddaughters who are due in September. Our family is going on a bus trip, a Baseball Tour of the NE. I love swimming in the summer! I'm going to Ocean City MD (in about a week) and can't WAIT. I have to stock up on sun screen lest I burn to a crisp. I would use your fabric for making quilt if I win. Thanks for the giveaway! I would make a quilted something. I'm hoping to make it to Texas and California to visit family and meet my new nephews. Over the summer we are hoping to back to galveston for a bit. Other than that I am just hoping we can find some fun things to do without getting overheated lol. We're moving cross country - PA to AZ!! I'll be sewing as much as I can before my machine gets packed! My daughter just asked for a turqouise quilt -- that's what I would use your fabric for. And that's what I'll be working on this summer. Hmmmm....if I win, I'll love it and then chop it up and make something really neat. We are going to Nicaragua on Thursday! We'll be going on increasingly longer camping trips over the summer. We just got back from camping for one night--got to get the 5 year old (and me!) used to roughing it! I really want to do more fun things with the kids this summer, so I am compliling some ideas to make a Summer Bucket List. I am off to follow your blog now! I'd love a chance to win! I have so many baby and little one quilts to make, this would be just perfect! This summer I'm having a baby! Baby #6, the first boy! is due in July. Thanks for the giveaway! I'll be spending time with family at the beach! I can't wait! I have so many nieces and nephews having babies....so I'm sure a baby quilt would be perfect for this fabric. I hope to get lots of sewing done this summer and just spend time with my grown children. I love visiting those parks with my grandkids that have water shooting out of ground....usually found in city areas. Any chance you have one near you....they are great fun on a hot day. I do love your blog. I stumbled across it a while ago during another SMS giveaway. My kids have been busy lately but some of their favorite activities lately have been painting the sidewalk with water( I just fill up a bowl with water give them each a paintbrush and they go to town) They aso love when I make a racetrack on the living room floor. This by far is my favorite all it takes is some masking tape. I tape a track to the floor they pay for hours racing around with their cars and then i pull the masking tape up and dispose of it. Fun for under a dollar. Thanks for the giveaway I would love to win. We will be swimming and sewing! Get your kids hooked on reading and you'll never hear "Mom, I'm bored!" Beach, Zoo camp and visits from cousins are our highlights this summer! Thanks! I'm having a baby next month--so excited! I see a quilt for my grandson in that fabric! Thanks for the chance to win. Oh my gosh, your hydrangea's are gorgeous! They are my favorite, though I've yet to have them look as good as yours! Sigh. Thanks for the giveaway! This fabric would be perfect for a baby quilt for my youngest grandniece, the adorable Emmie. Thanks for the chance. This fabric is lovely! THis summer I'm going to be having a baby so I'm keeping things low key! Hopefully, my BEST fun activity will be finishing up the packing of my house and finally getting it sold. We have a contract and a closing date set, but until that time finally rolls around, I'm not going to believe it's real. :) I enjoy your blog. We're going to the beach this summer and I can't wait! This summer I will be hanging out outside as much as possible with my two kids, letting them go back and forth between playing in the dirt and playing in the water (which is a great way to keep them busy, by the way!). I can't wait to sew and spend more time as a family this summer. The fabric is just lovely...thanks so much for sharing!! Your Farmer's Wife quilt is great! Lovely fabrics! My family is taking a trip hiking/kayaking in the UP in Michigan! thanks for the giveaway! This summer will hopefully be getting our house organized and ready for a big move across country. I'll be heading toward the beach this summer with my husband and 2 little girls! Thanks for the giveaway! Love these fabrics. Would probably use them as decoration in the new baby's room! What beautiful fabrics! I would probably make them into a quilt for my daughter. I plan to spend a lot of time with family this summer. As long as you can take the boys swimming every day, or nearly that, they will be happy. I would make a quilt top with these beautimous fabrics! I visited your finished quilts, and have to say, I LOVE the tickertape quilt. I've only made tickertape mug rugs, but that style is SO much FUN! I also really appreciate your Sunburst quilt...stunning! Oh my gosh, I want to eat that salad RIGHT NOW! This summer, I'm working at libraries around Rhode Island teaching art classes to teens and tweens. I'm also visiting my mom in Pennsylvania, going to the beach as often as possible (hurray for the ocean state!) and taking a women's weightlifting class on Friday mornings. My sister and niece live in Charlotte and are teachers in Charlotte-Meck schools. When I do not want to clean up a mess I give my grandchildren buckets of water and paintbrushes and have them "paint" the driveway. I like your Farmer's Wife quilt. :) My fave fabric line right now is Curious Nature. I love your Farmer's Wife - love the bright colors! I love Lorna by Skipping Stones Studios. Thanks for the giveaway! My favorite fabric line is Pure by Sweetwater for Moda. I actually won a charm pack of it back in January and just fell in love with it. I was hoarding it until Saturday when I finally cut into it and made a lap size quilt top for ME!! I am hoping to get out kayaking, more this summer. We did a lot of camping when our kids were young. i hope we get to go camping this summer! We're moving to China this summer! Where we're going is supposed to have nice beaches--hope to enjoy those! What a fabulous bundle of fabric! This summer will be spent mostly out in the sunshine with my 6 grandchildren! Probably being Pirates, or Secret Agents :) The 4 oldest are all boys and they are always up for adventure. I love making them costumes to go along with our theme :) My 2 youngest are girls (finally) that will both be 1 year old this summer, so adventuring will have to wait a bit for them. The fabric looks perfect for a quilt!! I cannot wait for more free time (aka sewing time)! I live in Michigan so I hope to spend some time at the beach with a good book. At home there will be a lot of gardening and as much sewing as I can work in. QUILT! There would totally be a quilt with that fabric in it. Maybe more than one! You are a very busy lady! I have a wedding quilt to cut and sew for the middle of August - and two baby rag quilts to finish quickly. The first one is for our granddaughter who arrived last week :) Right now my garden is taking my time but I really want to be with my sewing machine! Thanks so much for sharing! I will be traveling with my husband and son to see some things in Utah including Bryce and Zion. When I'm home I'll be making lots of quilts and the fabrics you are offering would be such fun to work with. Making quilts for kids is one of my favorite things. Thanks for the chance to win! Greetings from Colorado! This landlocked family needs some big time beach time. I could make a lovely bag with that fabric. Thanks for the inspiration on your blog and for hosting a giveaway! I'm remaking my yard so it looks pretty. We are going to Cape Cod for a family wedding and mini-vacaton. Thanks for the giveaway. I just tried out making side walk paint for the kids and it was a hit. There are tons of recipes online. Love that fabric! I'm a little jealous of your beautiful hydrangas but the flowers are coming here. Our apple tree is in full bloom and the perennials are growing...I love spring/summer! My favorite new line is Vintage Modern, can't wait to get my hands on it! Beautiful fabric! Love love love. I'm loving Summersville these days. My husband and I are celebrating our 50th Wedding Anniversary. Our 3 daughters and their families are treating us to a week on a lake in Idaho...all together for a fun time. Can't wait...but will need some fabric! Lovely fabric, We are going to Hawaii later in the summer. It is a great place. Maui is the real destination. Looking forward to lots of swimming and a trip to Disneyland (or two?). If I won the fabric, I'd make something fun, like a cute baby quilt for my best friend who's expecting in Sept! OR awesome shorts for my son! I will be going with a group of friends on a cruise to Alaska. My kids always enjoyed picnics in the back yard, making Popsicles, bike rides, catching fireflies, and any good old fashioned, no money kind of summer fun! beautiful fabric! plan on taking my dogs on lots of nice walks this summer! I plan to prepare on becoming the mother of a middle schooler! And catch up on some reading and sewing! It's almost winter here in Australia, boo hoo. But I am currently loving the Lark line by Amy Butler. Some it would be great for a smaller baby quilt I am making, what a wonderful giveaway! Also your patchwork prism looks like it's going to be gorgeous, can't want to see the final product. wahoo!! I had seen this under the US only and thought, 'aw shucks--it's beautiful fabric' So excited to be able to enter this :) it'd make some adorable dresses for my little girl!!!! I am looking forward to going camping this summer with my whole family! We'll be travelling to NC so my daughter can visit her grandparents, and so we can spend time at the beach! I'm hoping to do more kayaking this summer. I am hoping to spend a lot of time running my girls around to beaches this summer. I can't wait. My favorite line is Good Folks by AMH. We're planning on going to a nearby hillstation for the weekend..can't wait! Such pretty fabrics, thanx for the chance! I am most excited about our camping trip this summer. My children are 26, 21, & 6. So, we will be going to the library once a week, playdate once or twice a week, swimming lessons, gardening, weeding and lots of playing in the water hose. Hope it helps, most libraries have storytime once a week and summer reading programs for all ages. Mine all loved going and learned to love reading. The hydrangeas caught my eye, they are so pretty. I wonder if they would grow pink or blue here in our desert, rocky soil. Thanks for sharing! That'sa completely new fabric like to me, lovely! I'm looking forward to the summer by the sea with the kiddoes. I'm loving flea market fancy at the mo. I would tell you about my exciting summer plans, but it's nearly winter here! Thanks for the chance to win! Beautiful Fabric! This summer I am taking Rachel Hausers Handstitched Class! Oh, I love the fabrics you have chosen for the giveaway :). My favourite line at the moment is Lecien's Old New 30's fabric. So pretty and dainty! Thanks for the giveaway! I've been a bit obsessed with sewing kids' bags lately. What perfect fabric for a new baby playmat! Thanks for sharing such lovely fabric! Hi Courtney :-) Your Farmers Wife looks amazing! Keep going :-) you'll get there! That fabric looks so good! Just today I discovered a blog called redtedart which should keep you occupied for the whole summer. Beautiful fabrics. Thanks or the giveaway. gorgeous fabrics, I'm quite new to quilting, so these would be nice to add to a quilt for my girls, thanks for the giveaway! I'm a new follower. I can't wait to see what you're up to! Thanks for the giveaway! What lovely fabric. It would definitely get put to good use to make a quilt for my new nephew. I am really eager to attend our local Renaissance Faire! I'm headed to the beach! My fun thing this summer might be working on my prism. Oh, and going to NYC with my daughter for a few days for the 16th birthday. I'll be spending time in the garden and then cooling off at the pool. Can't wait. I always look forward to more outdoor exploration with my family in the summer! I have a few projects in mind for cousins/nieces/nephews, and this fabric would be perfect! Thanks for the chance to win! My fave line is Outside Oslo by Jessica Jones. Thanks so much for the give away and introducing yourself! My favourite fabricline at the moment is vintage modern! Keeping kids busy over the summer...bubbles, "painting" the house or sidewalk or whatever with water, digging in a pile of sand/dirt. Summer and kids, take them to the beach. That's the only thing that works for mine, although not all the time. I'm thinking of buying them a ticket to some other continent on summer, but something tells me my husband won't approve. We're looking forward to doing some camping this summer, can't wait! Lovely fabrics. Love the shorts. Fav fabric right now is Apple of my eye! I grew up in Hickory and now live in Raleigh so it's fun to read someone's blog so close to home! I have two little boys too and we're going to our local pool all summer! Love the giveway and finding your blog! Unfortunatly it is now winter here in South Africa, so I have to wait a while before going for a surf with my little boy again - counting down the days. Hi, Courtney - what a fun glimpse into your life - love the photos in this post, especially the hydrangeas. They don't grow where I live, unfortunately. I simply love the color combo in your giveaway fabrics! We moved from Charlotte to Indiana 8 years ago. We really miss it. We will be visiting family in Georgia this summer. This summer will be filled with farmers markets, putting new flower/shrub beds, reading [which I haven't made enough time for in years], more time with my hubby, and as much sewing as I can make happen. Great giveaway! I am working on the Patchwork Prism this summer too! So much cutting! I can't wait to sew it together! Beautiful fabric. I am hoping to keep my kids busy by gardening. Great fabric. I'm looking forward to taking a day off from work each week so I can do fun things with my daughter during her summer break. We live near the water so I'm looking forward to going to the beach. Late afternoon is my favorite time. The sun isn't as hot and everyone else has gone home and I can feel like I have the beach to myself. I am looking forward to hanging out with both of my boys all day this summer. Beautiful fabrics, thank you. I would love to make some small dresden plates and lots of pincushions with the fabric, both of which I am addicted to at the minute. I would love to make some patchwork tops for my girls with this fabric. what a wonderful give a way. thanks for the opportunity. with a paper towel i wipe off the shaving cream. the card stock picks up the colors of the ink. i let it dry and use it for the back ground in making a greeting card. originals all the way. 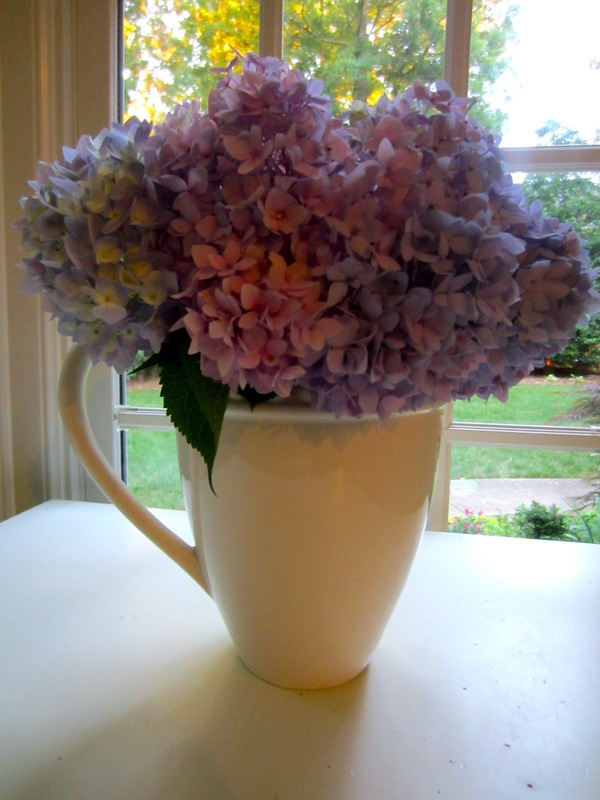 I'm in love of your hydrangeas - I've always wanted some in my garden! I'm looking forward to my girls being off of school for 2 whole months - so much mommy-daughter time! I am lucky - my 6yo likes watching me use the sewing machine so she sits and handsews while I am sewing myself. I just hope the novelty lasts through the summer! Your hydrangeas are lovely. My 'garden' is a basil plant in a plastic pot on top of the dishwasher. My favorite collection of fabric is Hello Pilgrim. Thanks for the giveaway. That is wonderful fabric! Your salad looks great, and I am jealous of your hydrangeas - weird weather this year means mine will not bloom. My kid (3) can "garden" (ie, dig holes in the ground, play in the mud and pull weeds) for hours and hours, so that might be worth a go: give them a little corner of their own. Thank you! Beautiful fabric! would love to win! well this summer i have a trip to Netherlands planned, to attend a birthday party of a 2 year old! it will be fun! I like the Curious Nature fabric line. Thanks for a nice giveaway!